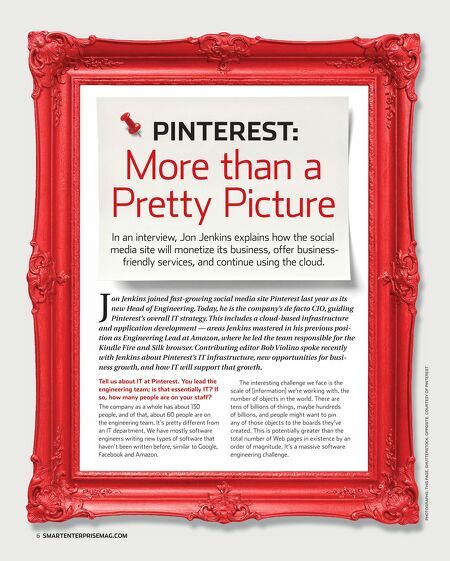 PINTEREST: More than a Pretty Picture In an interview, Jon Jenkins explains how the social media site will monetize its business, offer businessfriendly services, and continue using the cloud. Tell us about IT at Pinterest. You lead the engineering team; is that essentially IT? If so, how many people are on your staff? The company as a whole has about 130 people, and of that, about 60 people are on the engineering team. It's pretty different from an IT department. We have mostly software engineers writing new types of software that haven't been written before, similar to Google, Facebook and Amazon. 6 SMARTENTERPRISEMAG.COM The interesting challenge we face is the scale of [information] we're working with, the number of objects in the world. There are tens of billions of things, maybe hundreds of billions, and people might want to pin any of those objects to the boards they've created. This is potentially greater than the total number of Web pages in existence by an order of magnitude. It's a massive software engineering challenge. PHOTOGRAPHS: THIS PAGE, SHUTTERSTOCK; OPPOSITE, COURTESY OF PINTEREST J on Jenkins joined fast-growing social media site Pinterest last year as its new Head of Engineering. Today, he is the company's de facto CIO, guiding Pinterest's overall IT strategy. This includes a cloud-based infrastructure and application development — areas Jenkins mastered in his previous position as Engineering Lead at Amazon, where he led the team responsible for the Kindle Fire and Silk browser. 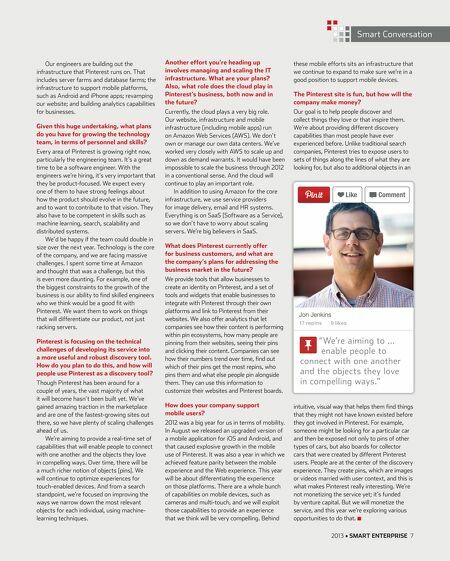 Contributing editor Bob Violino spoke recently with Jenkins about Pinterest's IT infrastructure, new opportunities for business growth, and how IT will support that growth.